The scanning project continues. 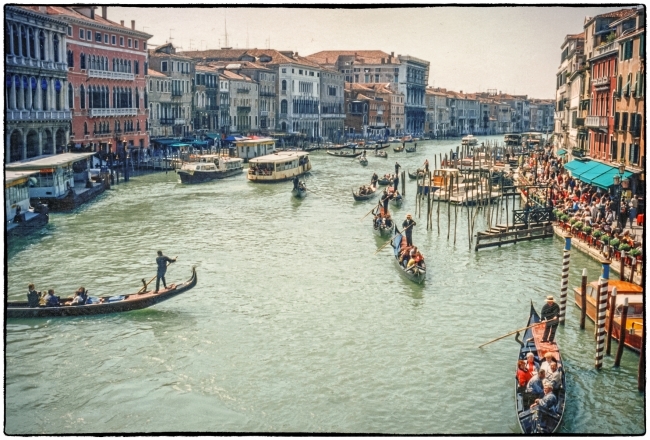 This “postcard” shot is a scan of a 4×6 print of the Grand Canal, Venice taken sometime in the 1990s. The view is from the Rialto Bridge and the camera is either a Canon AE-1 or a Minolta Hi-Matic 7sii, the only cameras I had at the time. Unfortunately I can’t recall which one. I vaguely remember sitting in a restaurant eating and then deciding to go up onto the bridge to take the picture. If that memory is correct then my wife is probably sitting in one of the restaurants on the left side of the picture.